It's been two weeks since I've been inside the house, and things have really come together. Today for the first time, I broke my own rule and went inside while workers were there. 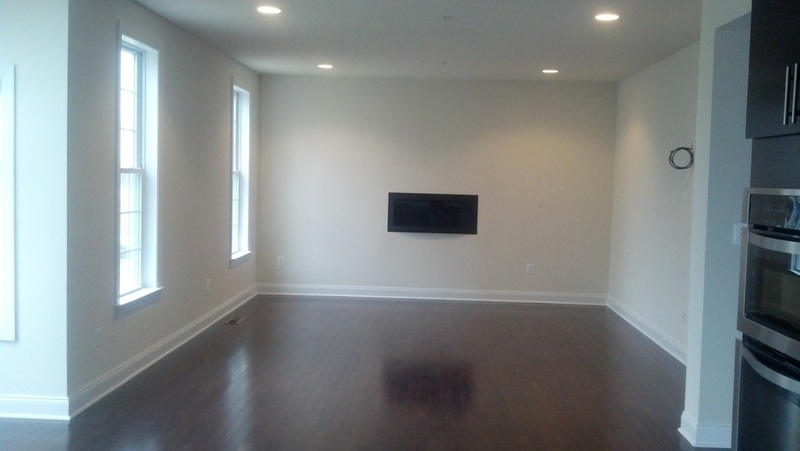 There were about half a dozen guys and one of them complimented me on my fireplace choice and custom second floor layout. 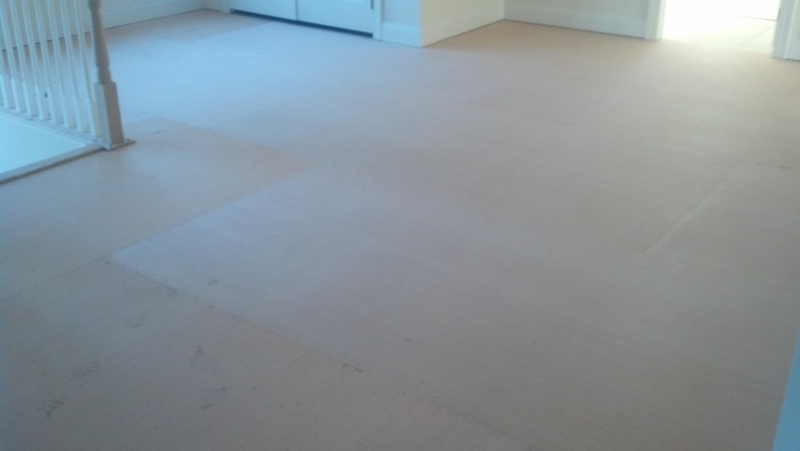 The hardwood floors have been installed, and the padding for the carpet has been laid down. 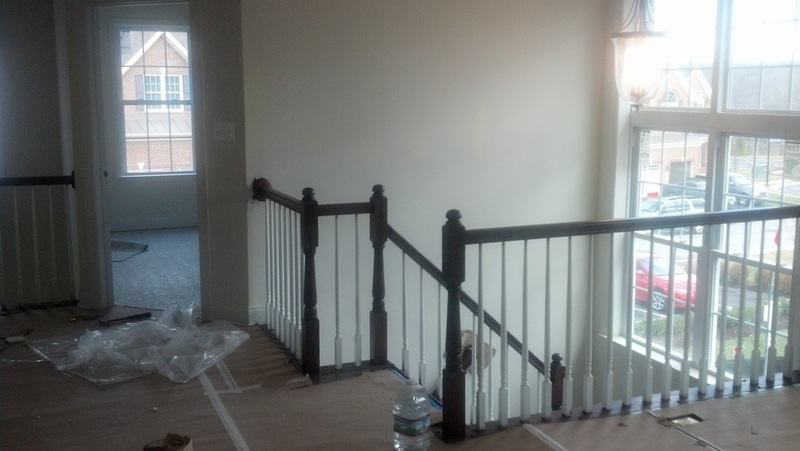 The stairs and stair railing have already been stained to match the hardwood floors. Some of the guys were just about to start laying the carpet while I was there. The electrician was also there, installing light fixtures, sockets, switches and covers. Some of the lights were being turned on and off as he tested them. The light fixtures outside were installed too. Also, the correct kitchen island counter top has been installed. There isn't too much left to do. I could see some areas on some walls that had a light yellow marking on them, and I assume that means they need touch up paint because when I took a closer look, the paint looked a bit thin in those areas. Also, some of the closet doors still haven't been hung, but I'm guessing they'll be hung after the carpet is installed since it's easier to install carpet without doors getting in the way. Of course, since the guys were there working, I didn't take as thorough of a look as I usually do. I have my walk through to do my final punch list on Jan 14. 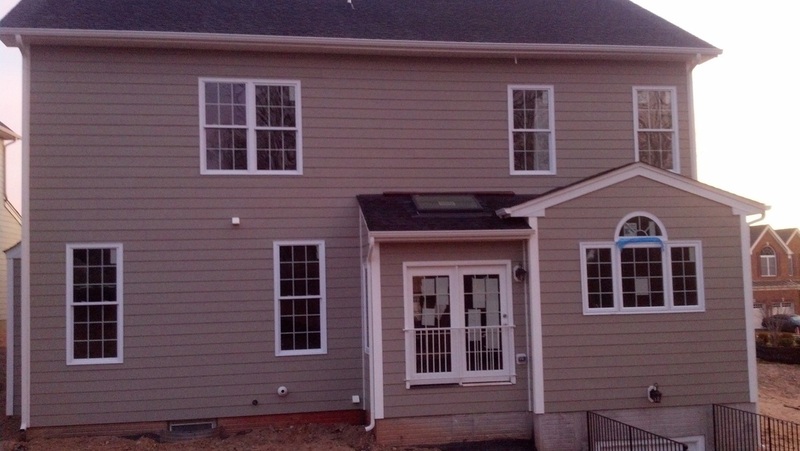 I will try to visit the house on Jan 12 or 13 in order to take some final pre-closing pictures. I will not be taking pictures during my punch list walk through. Just like with all the previous walk throughs, my focus will be on the house and not on taking pictures. 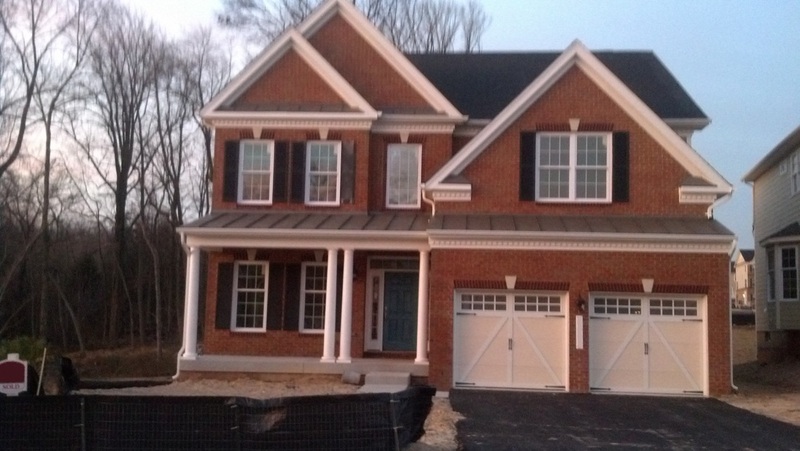 The punch list walk through is scheduled to take 2 1/2 hours, but I would like to make a "first draft" punch list prior to going to the actual walk through so I'll have an added incentive to visit the house to take those pictures. My realtor is coming to my punch list walk though, so hopefully between my own private walk through, and having her second set of eyes, we'll get everything. All the external light fixtures and my house number (which I erased for my privacy) have been put up. 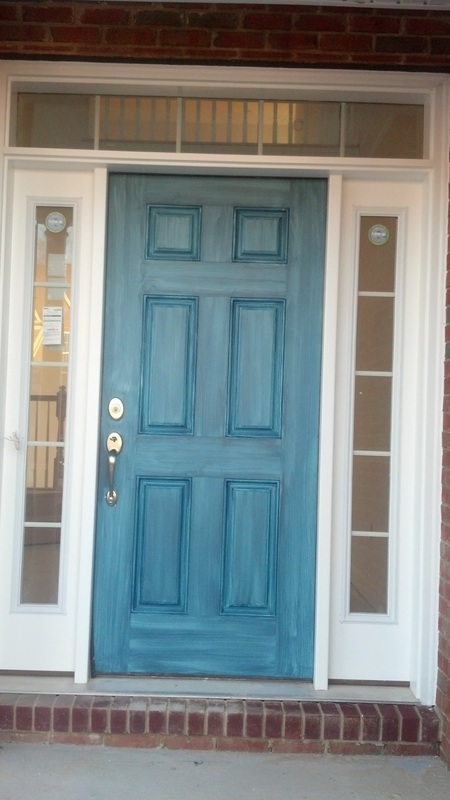 They still need to put a final coat of paint on the front door however. The "don't fall out of the house because you haven't put on a deck yet" grate has been put up. The kitchen island now has an overhang at normal chair height. The lights work! 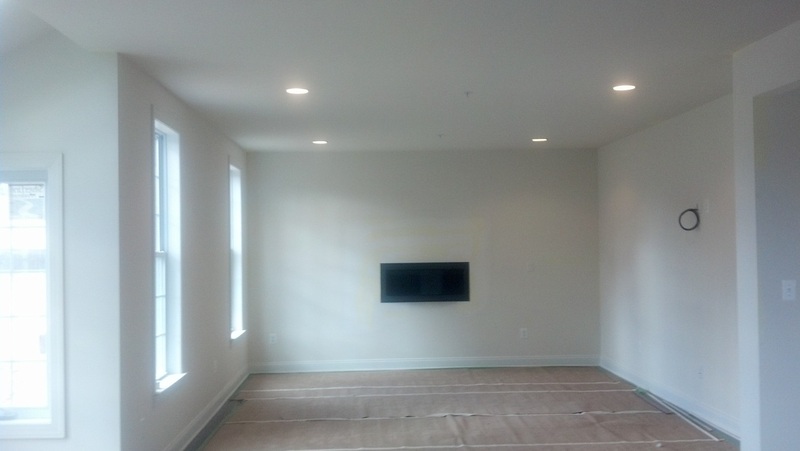 Also, if you look closely, you can see the yellow indicators for the painters, especially around the fireplace and in the corners. 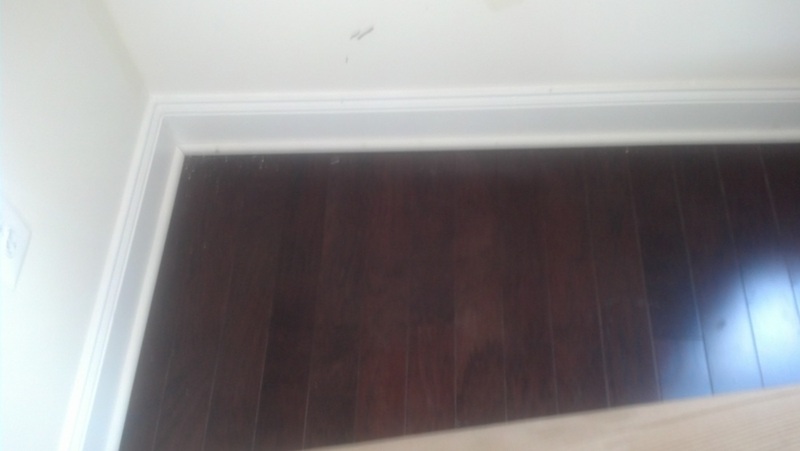 Most of the hardwood is covered with craboard to protect it, but I peeled a corner back in the office to take this picture so that you can get an idea of the color I chose. 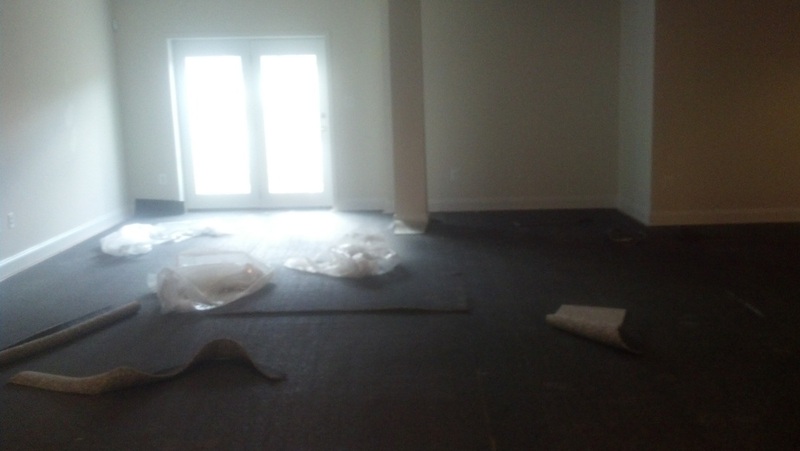 The basement with the carpet padding being installed. 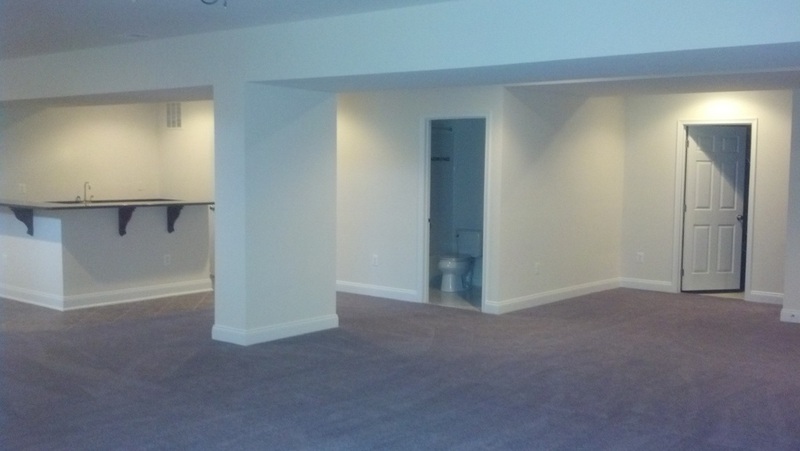 The bar area, which is tiled, is off to the right, not in this picture, so this is an angle of the basement that I don't think I've shown before. 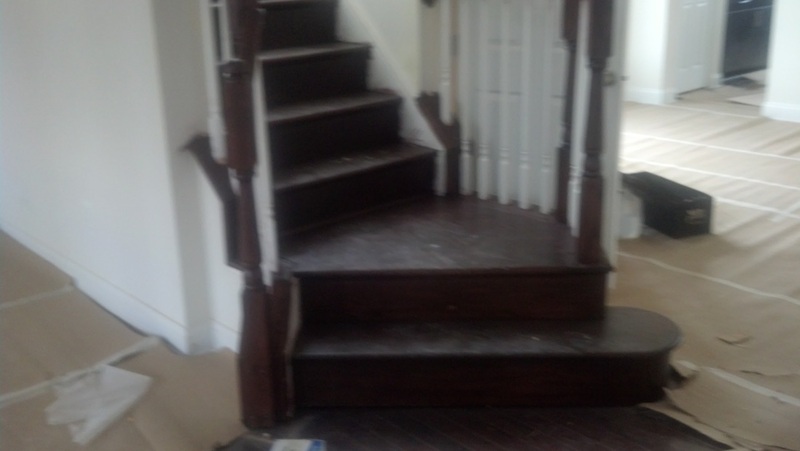 The stairs and railings have been stained to match the hardwood. 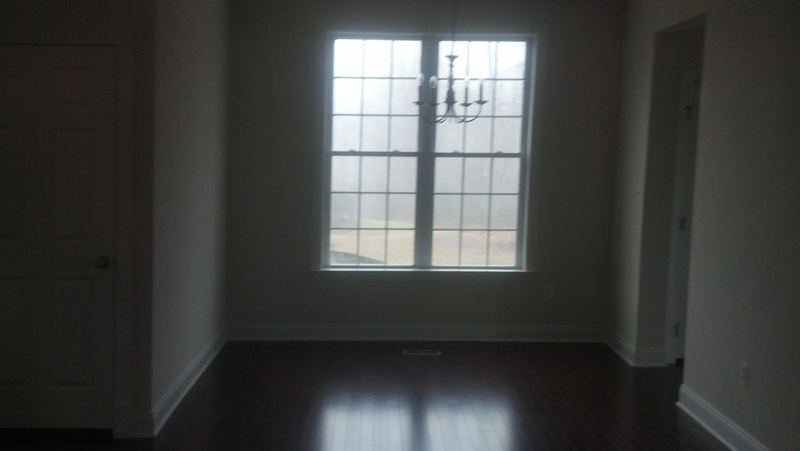 Toll includes a runner, but I opted not to have it because I like the look of hardwood so much. Oddly enough, the stairs don't have any protective covering on them and you can clearly see the dust from all of the traffic. 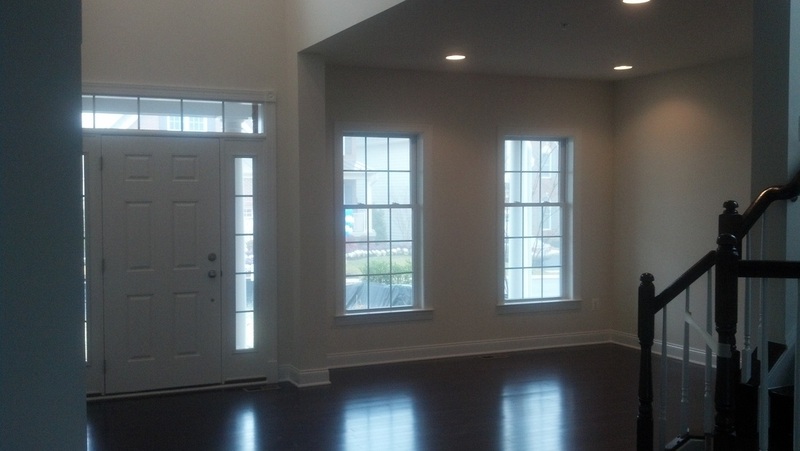 Just a general shot of the railing and a light fixture from the loft area. They've added the vent for the hood. Now they just need to add the cover and paint the surrounding area and the kitchen will be done (minus the electrical outlets, and flooring, which still have to be done everywhere.) 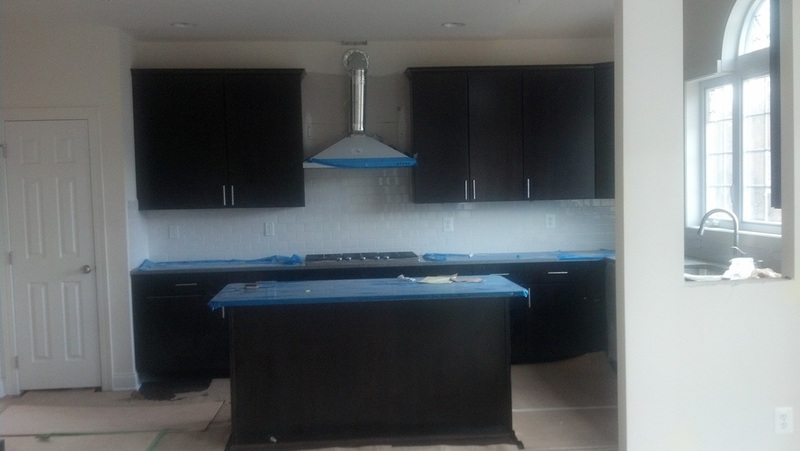 They haven't installed tee correct counter top for the island yet. 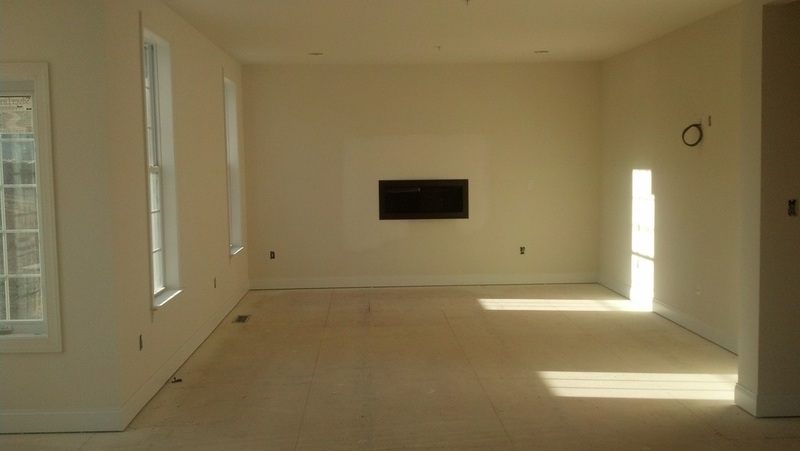 IF you look closely, you can see that they've added the frame around the fireplace, so now, they need to paint the surrounding area. The home wiring guys have also come and put on their face plates and made the wires accessible. 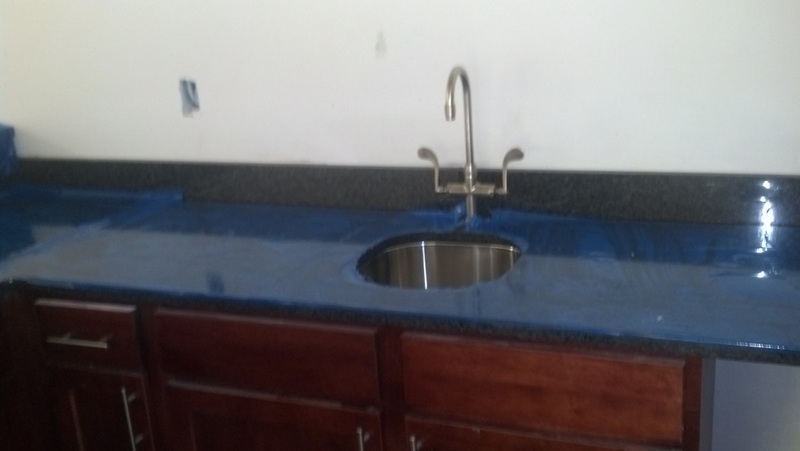 They've taken the protective covering off this part of the counter, so you can get an idea of the single bowl sink, and how the countertops look against the backsplash and cabinets. 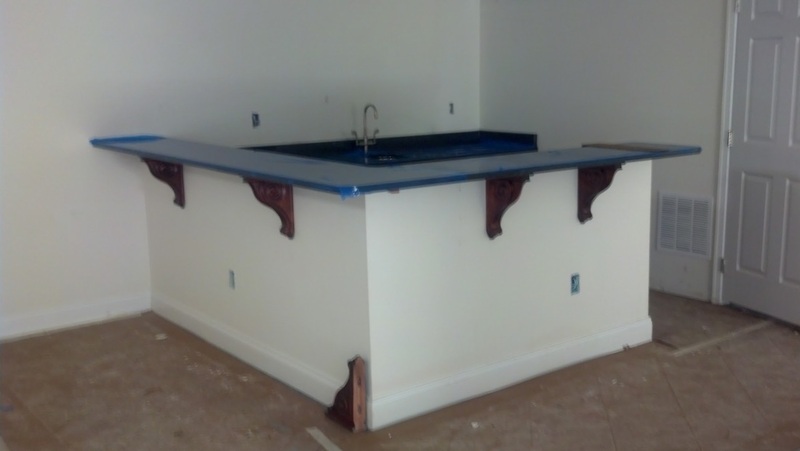 The bar countertops and sink are in. Most of the supports are also installed. I didn't get to choose the style of the supports, so they're a bit ornate for the modern look that I'm going for, but oh well. A close up of the counter top. 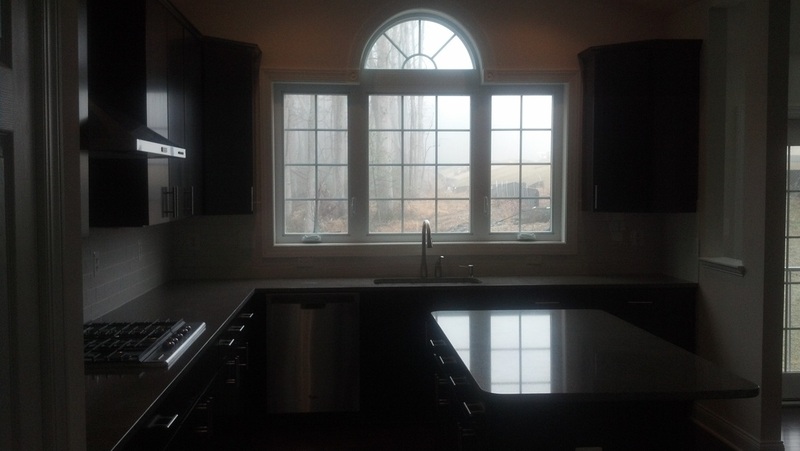 It's granite instead of quartz like in the kitchen, and it's more black than gray. 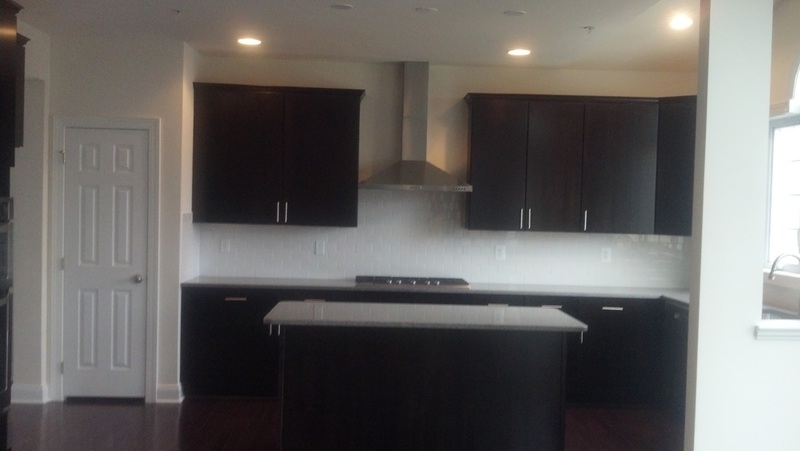 Yes, I like dark countertops. They've put down some sort of underlayment in preparation for the hardwood in the loft area. 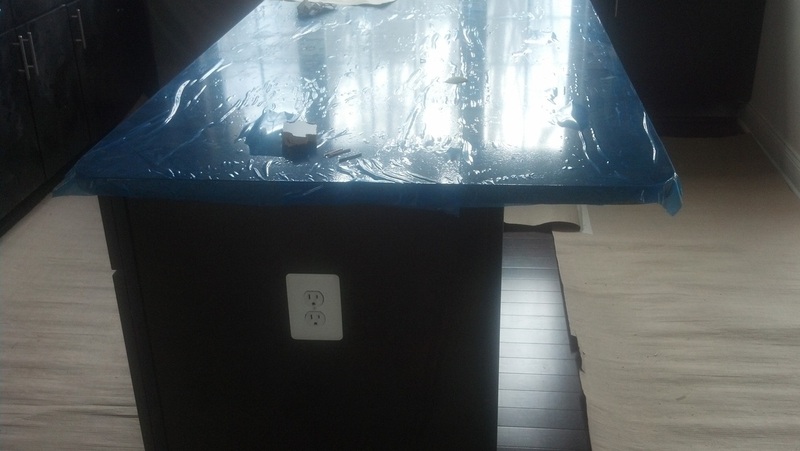 They've taken the protective cover off of the master sink countertop, which is the same countertop that is used for the bar countertop. 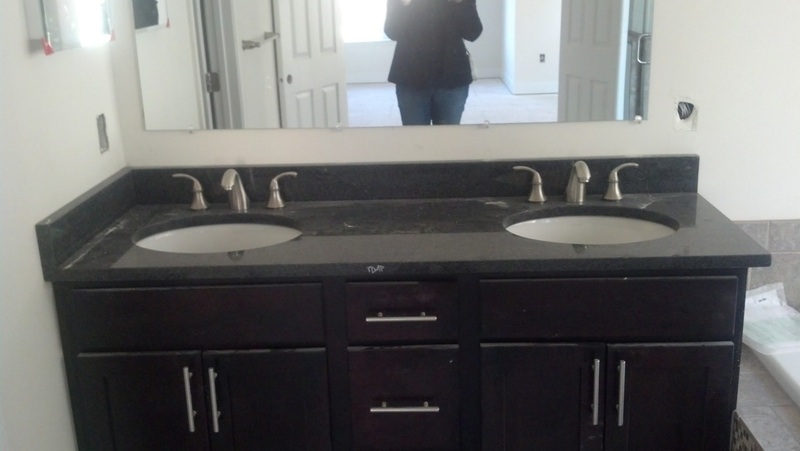 They've also installed the main mirror, but it's missing it's frame, and the medicine cabinet. 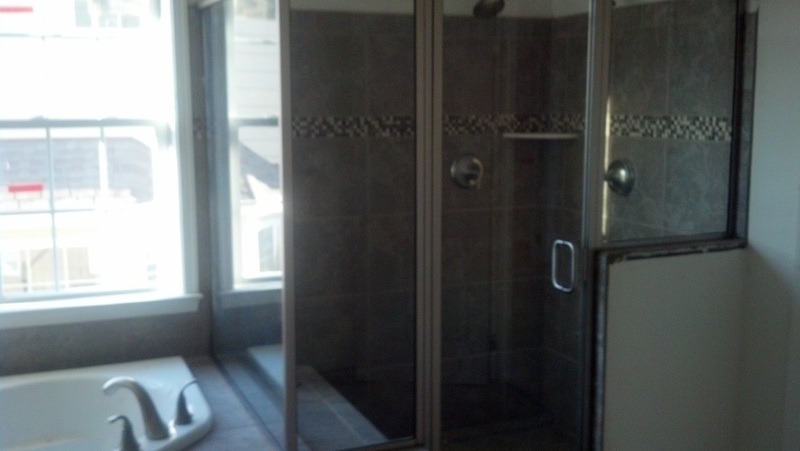 The shower frame is up. 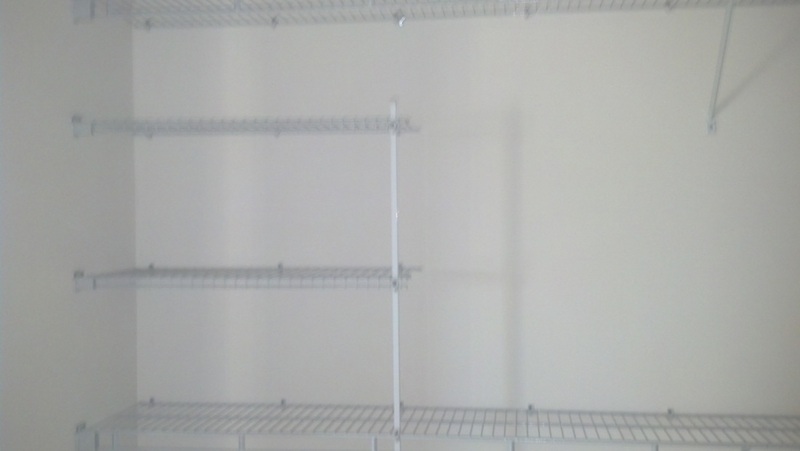 All the closets and pantry have shelving. This is one shot of the master closet. I'll probably replace this in the future, just because I cant't stand the lines it creates on folded clothes, and stuff always falling through the slots. The thermostat that controls the first floor and the basement. I didn't play with it to see if it's programmable, but if it's not, I'll be replacing it. 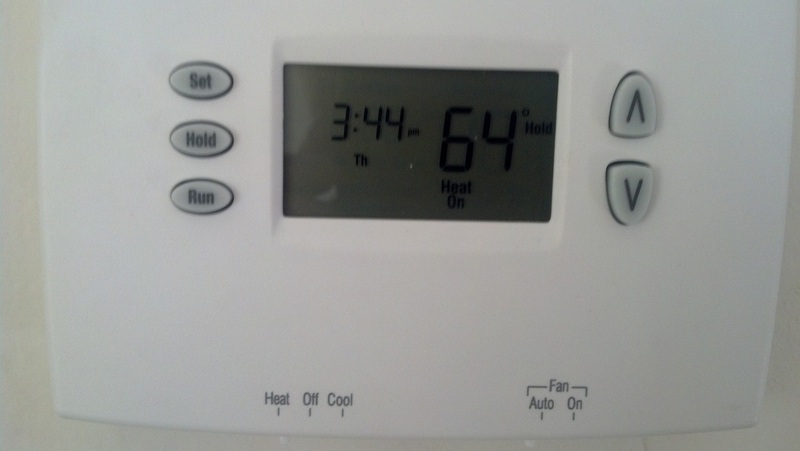 The same with the upstairs thermostat. The bathrooms have towl bars and toilet paper rolls. 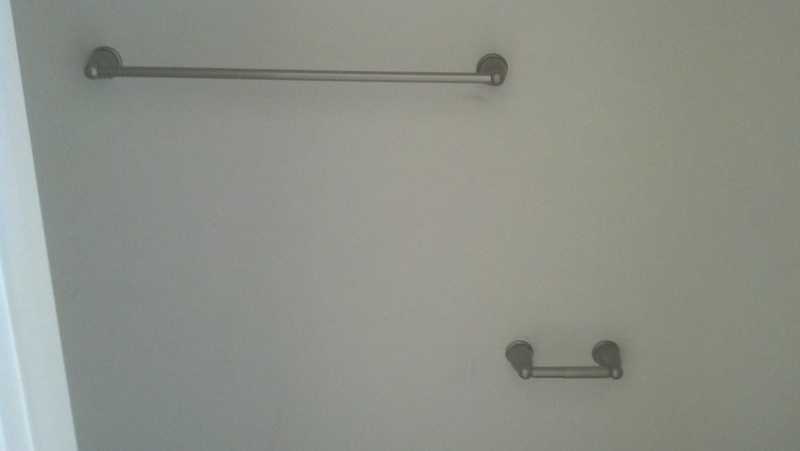 These are in the powder room. 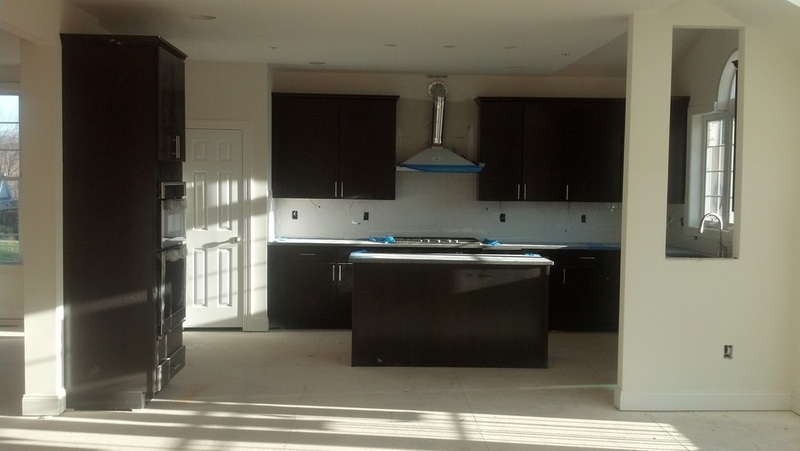 The appliances are in! They've also done more of the tile backsplash, as well as the missing listeollo in the hall bathroom. The structured wiring guys have also been back and have installed the alarm panels and face plates for all the wiring I had done. Sorry about the pictures again, but these were taken completely in the dark with the flash being the only light source. 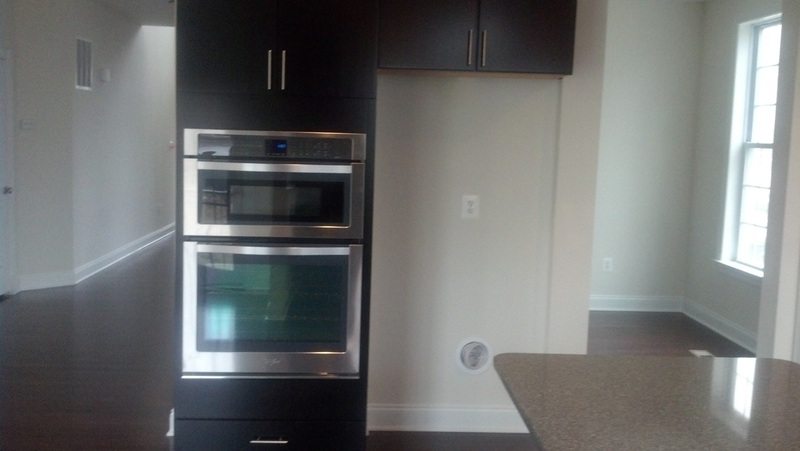 Whirlpool in wall microwave and oven. I was surprised to find that the interior of the microwave is not as wide as the interior of the oven. Whirlpool dishwasher. 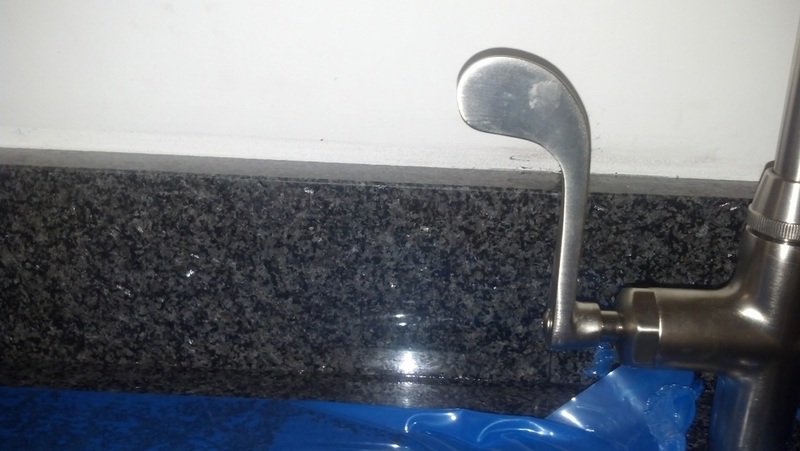 Also, they've busted a hole in the protective film over the sink, so they've probably been testing the running water. Happy Thanksgiving everyone. I stopped by the house and I saw huge amounts of progress. About 75% of the tile work has been completed, with only the bar area, a listello in the hall bathroom and the kitchen backsplash remaining to be done. 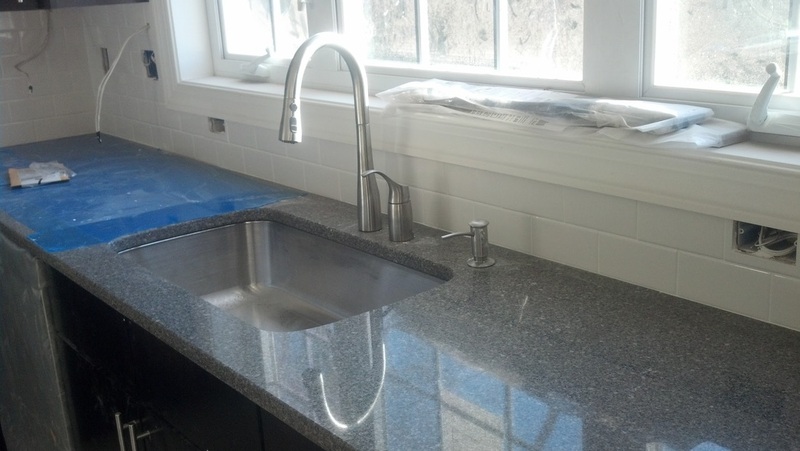 The kitchen sink and countertops have been installed, and the granite countertop in the master bath has also been installed. I didn't notice anything new done to the house, but take a look at the sidewalk that's been poured. It's been poured for my neighbor as well, who has the corner lot. 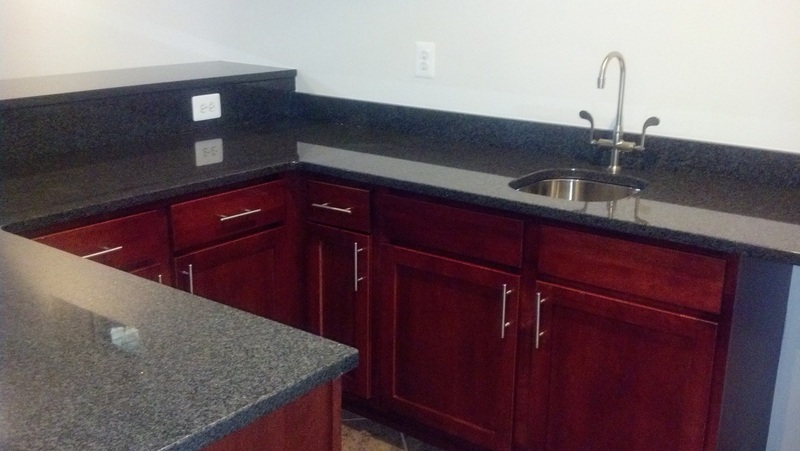 The quartz countertops have been installed. I'll have to talk to the project manager, because the island should have a 12" overhang. I'm not worried because I know they'll fix it with no gripes, but I'm pretty sure they'll have ot re-order the slab. Stair railing and ballisters are in my garage. The basement bath tile work. The tile work for the hall bathroom. THe listello has yet to be installed. The guest bedroom tile work. 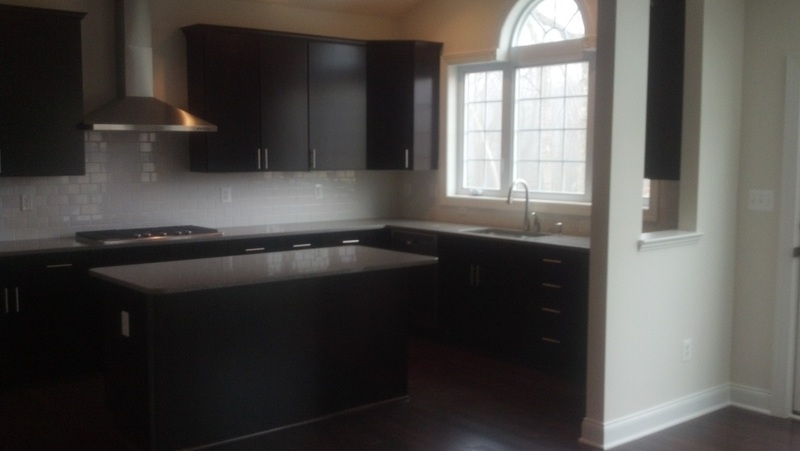 The main tile is the same as for the hall, but the listello and sink tops are different. 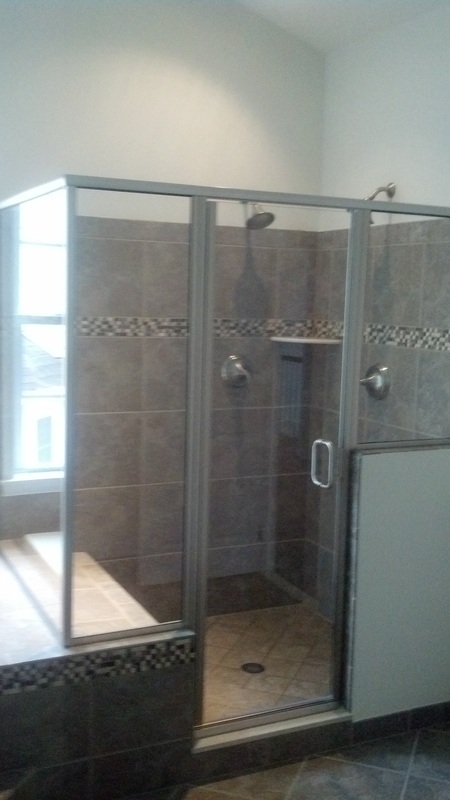 A shot of the master bathroom shower.